The illustrated AccuSharp Knife Sharpener is the AccuSharp Diamond Pro 2 Step Knife Sharpener - a compact two step sharpener that features pre angled coarse diamond and fine ceramic rods set into a brushed aluminum housing. Use three to four strokes through the coarse diamond rods to restore a dull edge, and three to four strokes through the fine ceramic rods to finish the edge. This AccuSharp Knife Sharpener has rubber molded grips and feet for safety, and a lanyard hole. The Diamond Pro 2 Step Knife Sharpener measures 2 3/8" tall by 2 1/2" wide. Made in China. 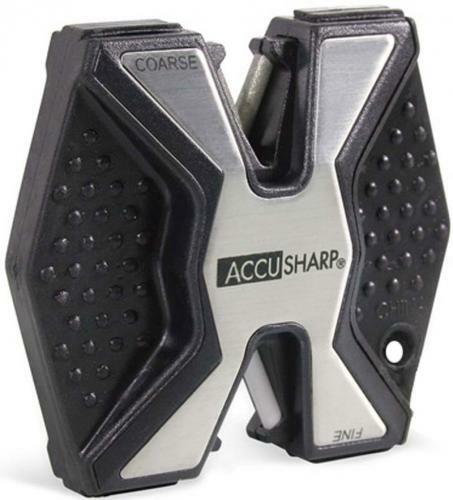 From the AccuSharp website: The AccuSharp Diamond PRO 2-Step Knife Sharpener features pre-angled coarse diamond and fine ceramic rods to sharpen, restore, and then polish a blade's edge. One of our newest "award winning" designs, the diamond rods are aggressive enough to sharpen all types of steel. The flip side consists of two ceramic rods used to finish and polish the edge for a smooth, sharp finish. The Diamond PRO 2-Step exterior is made of brushed aluminum and finished with a rubber molded grip and rubber feet for safety. The unit has a lanyard hole which allows for easy attachment to cord or string.